I am super excited to show you my latest creation! 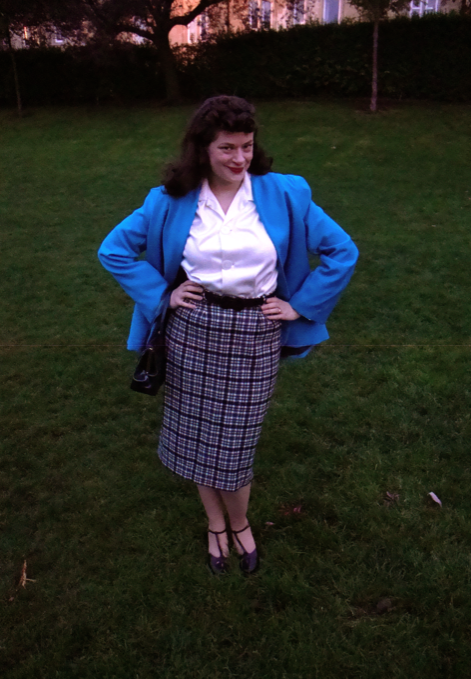 You may have guessed from the sewing inspiration board from this week that it was going to be a swing jacket. I'm a HUGE fan of 1940's musical films and one of my absolute favourites is 'Cover Girl' with Rita Hayworth and Gene Kelly. In that musical, Rita wears a very stylish swing type jacket that is very reminiscient of the mid-1940's (photos of Rita's jacket on my inspiration board). McCall 3619 fit the bill perfectly for a swing jacket! I actually think this is a rare pattern as it's the first time I've seen a swing jacket so early in the 1940's (this pattern is from the year 1940). They didn't really come into full fashion until 1943/44 and later in the decade (1946/47) and again throughout the 1950's. When I was in NYC for the fabulous blogger meet-up, I bought some amazing bright teal/blue wool twill from Paron Fabrics (it's actually much brighter than in the photos which were taken at dusk). It's absolutely buttery and fabulous to sew! You might think it's odd that I would buy wool in the States when Scotland has such fantastic wool (which it does!) but I've found it hard to get 'unusual' colours of wool in Scotland. We've got the best quality (and prices--even compared to the States) on high-quality wool in traditional colourways but we don't really have many of the brighter or funkier colours! I've never sewn with wool twill and I must say that I LOVE it! The pattern was very easy to put together and is fully lined. I opted for view C with the box sleeves. It's funny because whoever had used this pattern before me had shorted it by about 1 inch. I had originally thought of leaving their alterations and doing mine shorter too but decided that I wanted the longer length. Now in retrospect I think I would have liked it a bit shorter! I really love the rounded front lapel and the neat pleat in the front shoulder areas. I am also a huge fan of pleated sleevecaps! I'm glad I went for the boxy sleeves as that will make this a perfect layering jacket for winter! The back of the jacket does take that 'swing' jacket shape but not as much as I had hoped. I think I may have to coax it into more of a soft pleated shape with some very gentle ironing! So far when I polled the readers at the Sew Weekly--they are leaning towards the godet skirt--though many more clover votes are coming in! What do you think? Lovely jacket and a great outfit together. So stylish! I think the skirt would be lovely with the jacket. Initially I thought the skirt, then I rethought. A skirt with swing won't look right with a jacket with swing, it will be unbalanced. Slim pants will look much better. What a glamourous coat! It's such a pretty shape and the colour is Devine! Definitely the godet skirt! I feel like you'd get much more wear out of it than the capris in that color/fabric. That said-- wow! The jacket looks great. I love the color you chose. So bright and vibrant, which can be a real bonus in cold weather! The whole outfit really is smashing. You look great! I am voting for the clover pants, because then you will be able to wear them together. The skirt has to much fullness to wear with your wonderful new jacket. Gorgeous jacket! I agree with Rachelle. You already have a great skirt to wear with the jacket. Trousers/slacks would be a nice addition, and probably look better than the skirt. Gah, I love this jacket!!! I definitely want to see you make the skirt out of the jacket fabric. I know you would rock a pair of tartan Clovers, Debi. Go for it! oh debi this is GLORIOUS!!!!! i must say... i'd love to see you in the clovers. and once again i think david would agree. 40s musicals?! the next time we visit, we are so watching 40s musicals. gene kelly is my absolute favorite. Lovely, I find that the pictures on pattern covers always exagerate the amount of swing, I've just made a similar but d/b jacket and it looks great with a very slim skirt. I never knew that that's what swing jackets were. I personally prefer A for looks, but I think the capris would be more interesting. You don't see people sewing trousers often! Gorgeous! I adore the color, and the shape is just perfect! Love it! I am leaning towards the clover pants, although the skirt looks cute too. Depends on the drape of the fabric, I guess. Good luck with making a choice! i know i already commented on the sew weekly post, but i feel that it bears repeating: HAIR. your hair looks amazing!! Skirt. You may find that 1 1/2 yards is not long enough for trousers, unless you have really short legs. I have merely short legs, and need 2 yards to be sure to have enough length. Lovely color -- glad you thought to snap it up when you made your trip home. Godet all the way!!! I adore the jacket, of course, and it's so interesting to read your take on wool availability. Whodathunk? I vote for the Godet skirt. The Clover seems more mid-50s/early 60s than 40s? I love your hair too! Did you do something new to it? Godet skirt all the way!! Lovely pattern. It looks fabulous. I love the colour. I think you should make the godet skirt. Gotta be the skirt! I just love godet skirts. And that colour is amazing! Debi, that is such a beautiful coat! And I'm with the others - the godet skirt would be gorgeous in that fabric. Clover takesmy vote. Debi your creations are superbe ! I say go for the skirt. I've heard the pants are a little weirdly low-waisted. Could you do a post on where you buy wool in Scotland? When I was in Ireland two years ago, I thought I would find wool everywhere only to be severely disappointed. Can't decide on the what-to-make-next question. Your slim peacock skirt looks delish with the swing coat. In that vein, I vote for the slim Colette pants. On the other hand, I can totally see this blue wool made up into the godet skirt. Hi Debi ! I think you should make the Collette pants. I'd love to try those too. I have yet to make up the pattern you gave me but now the weather is cooling a tiny bit so a long sleeved dress is a good idea. 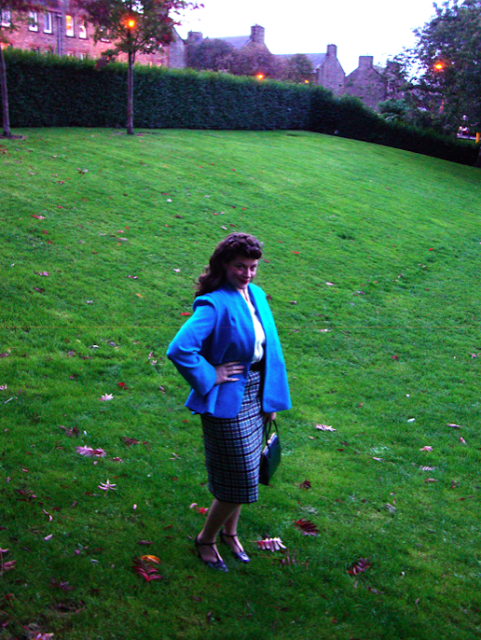 ( it was a long sleeved 40's dress) thanks for sharing at my blog link party and of course you did a fab job on that coat! I enjoyed reading about your New York meet up over at The Sew Weekly. Beautiful jacket! And that color is absolutely fabulous on you!